Prime Minister Theresa May is safe, a statement from her Downing Street office said, and she was seen getting into a car and being driven away from parliament. 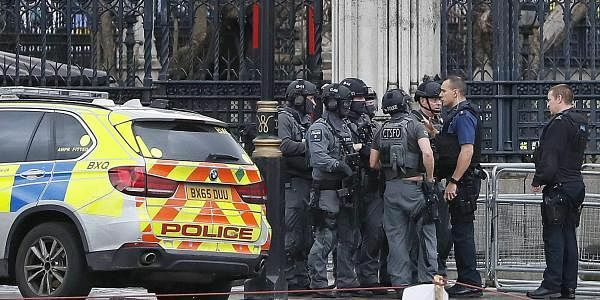 LONDON: Britain's Parliament was locked down Wednesday after an attacker stabbed an officer and was then shot by police, and witnesses said a vehicle struck several people on the nearby Westminster Bridge. London police said they were treating the attack as a "terrorist incident until we know otherwise." The threat level for international terrorism in the UK was listed at severe. The city was also on alert for the Thursday funeral of Martin McGuinness, former IRA commander. "When I got inside I was wondering what the hell was going on and I saw dozens of panicked people running down the street," he said. "The first stream was around 30 people and the second stream was 70 people. "It looked like they were running for their lives," he said. Sikorski, a senior fellow at Harvard Centre for European Studies, says he saw at least five people lying on the ground after being "mown down" by a car. Prime Minister Theresa May was at Parliament when the incident began, but her office says she is safe. The scene unfolded within clear sight of the London Eye, a large ferris wheel with viewing pods with views of the capital. Footage showed the pods full as viewers watched police and medical crews on the bridge.